The Council of Economic Advisers is organizationally part of the White House. My usual suggestion when reading its reports, under administrations of both parties, is that you can take or leave the politic elements of the report as you please, while still picking up a lot of useful facts and analysis from the figures and discussion. In that spirit, here are some points that struck me from the May 2014 CEA report, "The All-Of-The-Above Energy Strategy as a Path to Sustainable Economic Growth." As a starting point, here's an overview of U.S. energy consumption over the country's history. 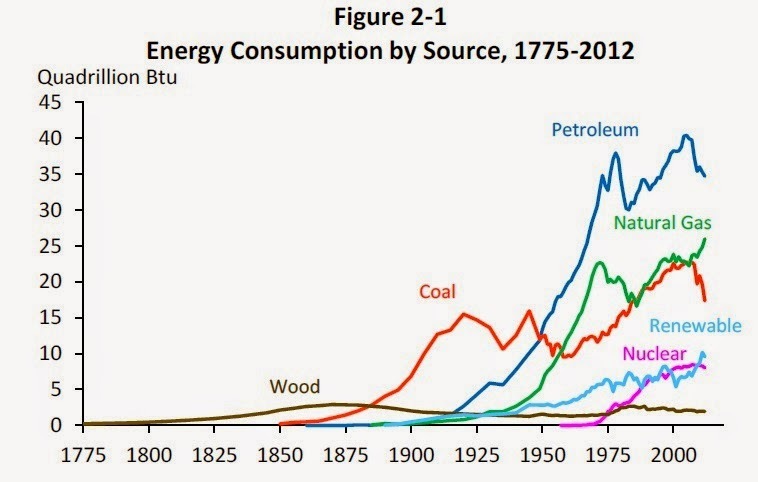 You can see the dominance of wood as a fuel source in the late 18th and into the 19th century, followed by the rise of coal in the late 19th century, and then the arrivals of petroleum, natural gas, and nuclear. A close look at the right-hand side of the figure shows some changes in the last decade or so. Petroleum and coal are down, while natural gas and renewables are up. It's worth remembering how unexpected these changes are. Here are some figures that show the 2006 forecasts from the Energy Information Administration, the 2010 forecasts, and the 2014 forecasts. 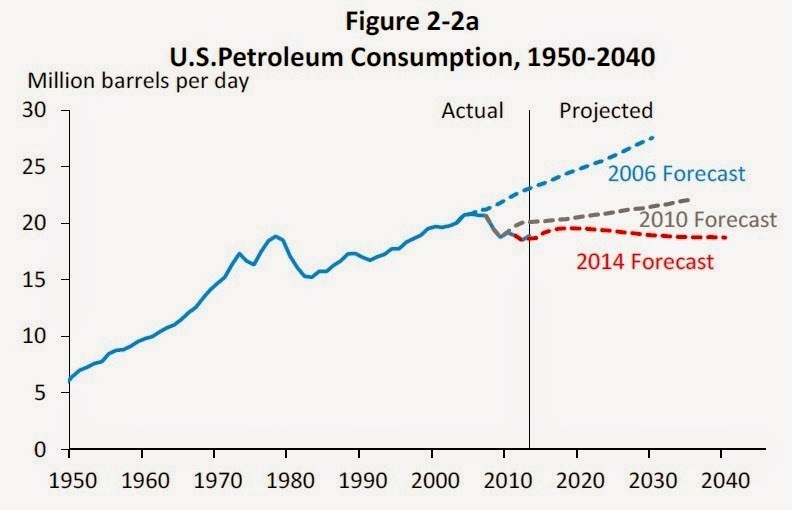 The drop in petroleum consumption, the rise in petroleum production, and the rise in natural gas production were not expected in 2006, and have changed more rapidly than was predicted in 2010. Interpreting the pattern of "renewables" is a little tricky, because that category includes hydroelectric power. 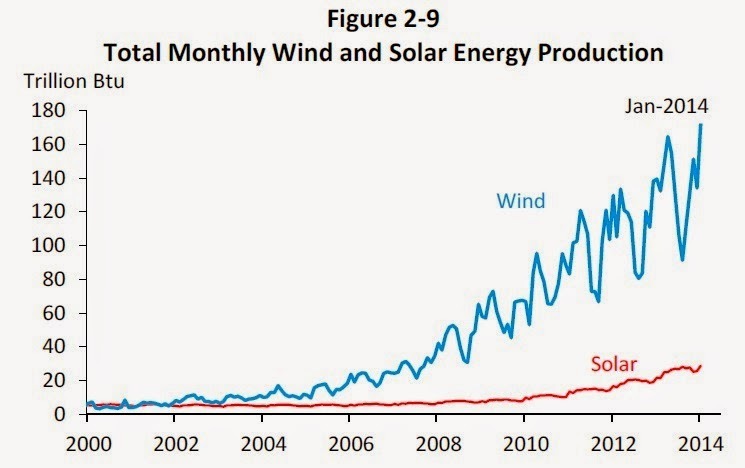 Wind and solar are rising rapidly, as this graph shows. But beware of what's on the vertical axis! 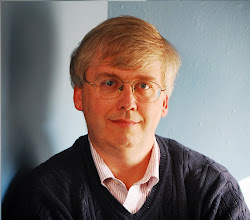 The first figure above measured in quadrillion BTUs per year; this figure is in trillion BTUs per month. Thus, two statements about solar power can both be true. One statement is that total production of solar and wind has risen by a substantial multiple. The CEA report notes: "In addition, total energy obtained from wind, solar, and geothermal sources has increased five-fold since 2005." The other statement is that this increase was from an extremely low base, and so the total production of energy from these sources remains low. For example, if solar energy production is about 30 trillion Btus per month, as the figure suggests, then it would be about 360 trillion Btus per year--which would be essentially invisible if it was illustrated as .360 quadrillion Btus on the first figure above. The report considers the macroeconomic consequences of these shifts in energy prices, especially the decline in natural gas prices. 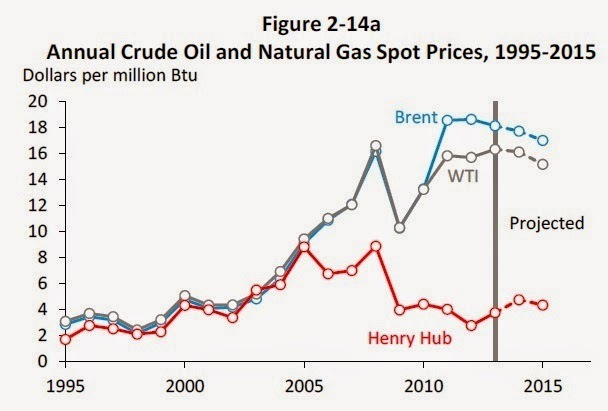 In the past, it was common for the energy price of oil and natural gas to be the same, when measured in terms of the quantity of energy that they deliver. But starting around 2005, natural gas prices in the U.S. have become substantially cheaper per Btu delivered than the price of oil. In the figure below, Henry Hub is a place on the natural gas distribution network in Louisiana which serves as a benchmark price. WTI refers to the benchmark West Texas Intermediate price for crude oil, while Brent essentially refers to the price of North Sea oil, which is often considered a benchmark for global oil prices. Crude oil prices are set in a global market; that is, the basic price for crude oil, before taxes and transportation costs, is much the same everywhere. But at least for now, natural gas is not easily shipped overseas, and so the price is set by supply and demand in regional markets. 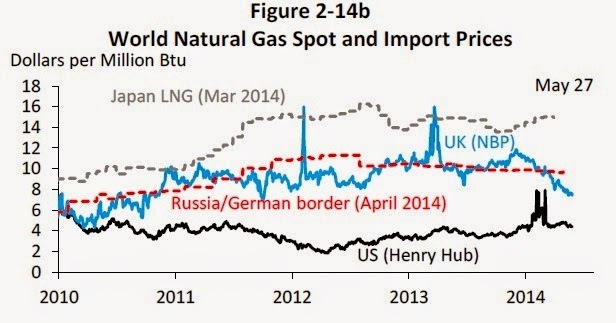 In the last few years, natural gas prices have been consistently a lot lower than in other high-income countries: less than half the price in the UK or on the Russia/German border, and less than one-third the price of what Japan pays for imports of liquefied natural gas. 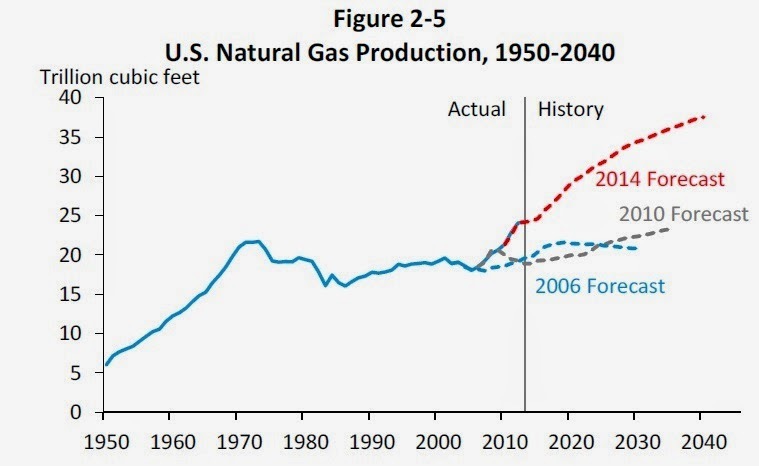 The CEA report discusses various economic consequences of cheaper natural gas: gains in direct jobs from production of natural gas, spin-off jobs, cheaper energy for U.S. firms than for their global competitors (which should give a boost to U.S. manufacturing), and an overall reduction in trade deficit. 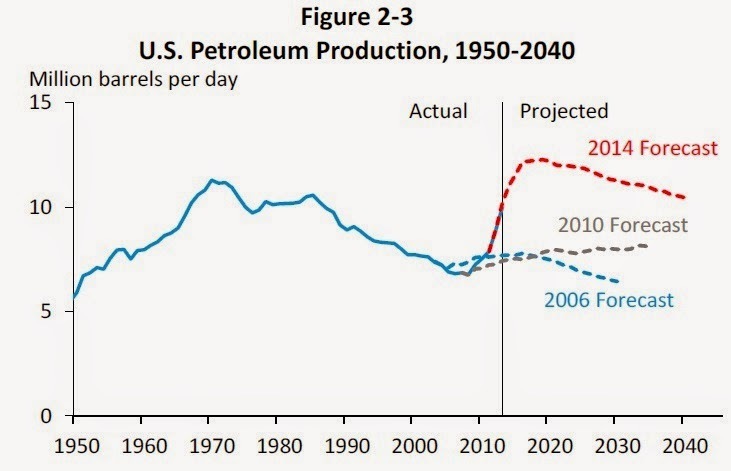 Given that crude oil prices are set in a global market and petroleum is still the single biggest energy source for the U.S. economy, the U.S. economy cannot be fully insulated from movements in world energy prices. But it can be less affected by global energy market fluctuations than in the past.